Calphalon Sauce Pan Just $48.79! Down From $110! PLUS FREE Shipping! You are here: Home / Great Deals / Amazon Deals / Calphalon Sauce Pan Just $48.79! Down From $110! PLUS FREE Shipping! Don’t miss this amazing deal from Amazon! Grab this Calphalon Contemporary Nonstick 3.5-Quart Sauce Pan for only $48.89, down from $110.00, PLUS FREE shipping! The Calphalon Contemporary Nonstick 3.5-Quart Sauce Pan features a stylish, modern design that looks great in the kitchen while offering reliable everyday performance. Ideal for cooking pasta, vegetables, rice or beans, this sauce pan features integrated straining holes in the lid that line up with pour spouts to allow you to quickly and easily drain liquid without needing a separate colander. And unlike most hard-anodized cookware, this sauce pan is dishwasher-safe too! 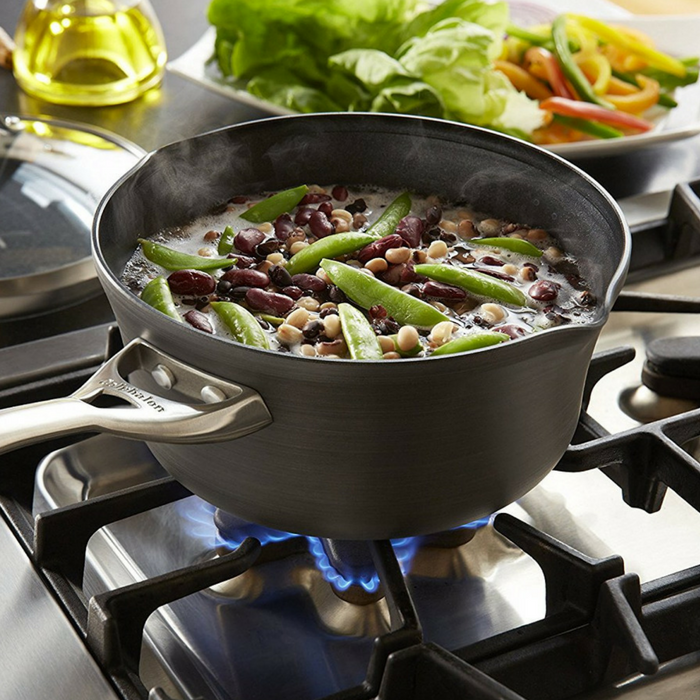 Heavy-gauge aluminum construction of saucepan with straining lid ensures even heating and is hard-anodized for durability. It also makes it dishwasher-safe. Cook pasta, vegetables, rice or beans, and then drain liquid by using the integrated straining holes in the cover. It’s fast, easy and you won’t have to use a separate colander.